If any readers are considering investing in new outfits for spring, they might find some ideas here in these plates of over a century ago from Capper & Sons of 63 & 64 Gracechurch St, High Class Tailors, Riding Habit & Breeches Makers, & Juvenile Outfitters, courtesy of the Bishopsgate Insitute. Black Vicuña with silk facings !, mmmm that must have cost a pretty penny! What fun love the drawings ! And the trees MUST stay ! I was intrigued to read the riding outfit was called capers quorn habit. I have always associated quorn with the mushroom protein. A search though on Google shows that there’s a village of Quorn in Leicestershire that was once associated with industrial knitting. So I guess that means it’s a knitted outfit. And I hadn’t realised that llama wool was available a century ago.! I think the Quorn is the name of a hunt in Leicestershire. The Oxford English Dictionary gives this definition of Quorn: “The name of a celebrated hunt that meets at Quorndon (formerly Quorn) and in the surrounding area of Leicestershire and Nottinghamshire. Also more fully Quorn Hunt.” The Quorn habit would be an outfit appropriate for wearing at the meet. 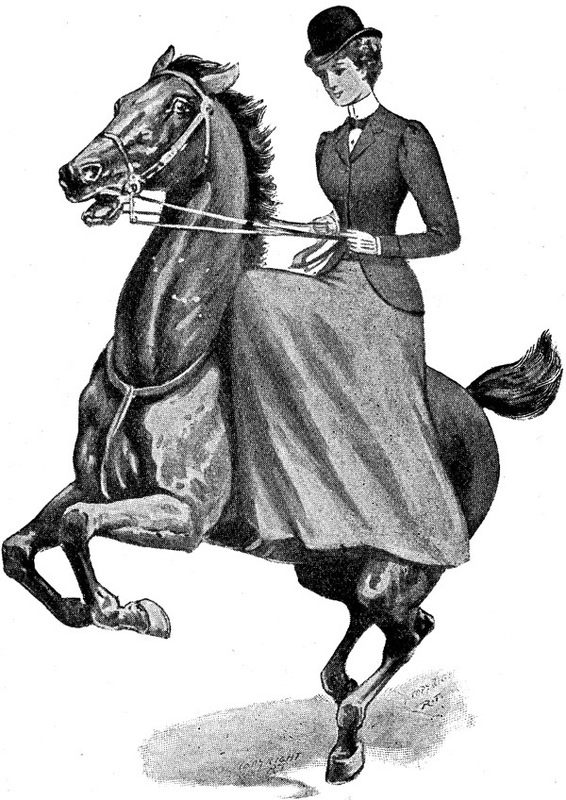 In 2012, novelist Susanna Forrest wrote about riding sidesaddle in a corset. Twenty-eight women chose to ride sidesaddle at Quorn that year. I wonder how long the skirts were? Yes,the Quorn is England’s oldest hunt and the hounds were kenneled there till 1904. Women did ride side-saddle to hunt so this is probably a very fashionable hunting outfit. fascinated by the footwear ! You would not find toffs like that in the East End.